Charles, Prince of Wales, is next in line for the British throne. He was probably the most photographed and written about person in the Western world in the late 1970s, but his ex-wife, Diana, Princess of Wales (1961–1997), surpassed him in popularity. He became a single parent to his and Diana's two sons after her death and an active voice in favor of economic and social issues. Prince Charles Philip Arthur George, the eldest of four children of Princess Elizabeth (1926–) and Prince Philip (1921–), was born on November 14, 1948, in Buckingham Palace. After the death in February 1952 of his grandfather, King George VI (1895–1952), and his mother's succession as Queen Elizabeth II, Prince Charles became the Duke of Cornwall, a position that includes the ownership of a large portion of valuable property, and placed him next in line for the throne of the United Kingdom. Charles, who was an obedient, shy, and somewhat awkward child, was first taught at home by a governess. In 1956, however, his parents broke from tradition and decided to send him to a local day school, Hill House in Knightsbridge. During his time at Hill House Prince Charles was often pursued by members of the London press. This continued after his enrollment in 1957 at Cheam in Hampshire, England, an upper-class preparatory school his father had attended. In July 1958, during Charles's stay at Cheam, the queen named him Prince of Wales and Earl of Chester. Still, Prince Charles was treated much like the other boys at Cheam, sharing a room with nine others and doing chores. While at Cheam the prince developed his sense of humor and his interest in theatre. In part to avoid the press, Prince Charles chose to attend Gordonstoun, a school located in a remote area of northern Scotland. It was known for its strict rules, its tough living conditions, and its emphasis on social responsibility and community service. The prince attended Gordonstoun from 1962 to January 1966, and then was sent to Australia to attend Timbertop, a branch of the Geelong Grammar School. The isolated location and physical activity provided the prince with an increased sense of self-reliance. "Australia," he was later to say, "conquered my shyness." Prince Charles returned to Gordonstoun in September 1966 and during his last year rose to become head boy, or guardian, of the school. He enjoyed acting in plays and became interested in classical music. 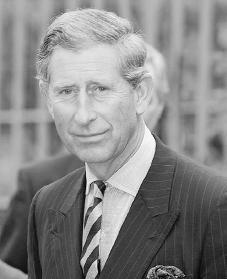 After much thought, it was decided that Prince Charles would complete his academic career at Trinity College in Cambridge, England, where his grandfather George VI had also attended. The prince entered Trinity in October 1967 and continued his musical and acting pursuits while earning average grades in archaeology and history. In 1969 Prince Charles was sent to University College of Wales at Aberystwyth in order to learn Welsh history, language, and literature in preparation for the official ceremony that would name him Prince of Wales. He returned to Cambridge in the fall of 1969 and received his degree in 1970, the first member of the royal family to do so. Following family tradition, he spent the next seven years in the military. He attended the Royal Air Force College at Cranwell and the Royal Naval College at Dartmouth. During his time in the Royal Navy the prince served tours of sea duty, learned to fly helicopters and to skydive, and was given command of the Her Majesty's Ship (HMS) Barrington. In 1977 Prince Charles began his role as Prince of Wales. Up to this time the prince had taken part in some public events. From 1977 on, however, his public activities as Prince of Wales increased in number and importance. He lent support to many charitable causes, especially those having to do with youth and the environment. He represented the royal family at home and served as a goodwill ambassador (representative) abroad. In 1978 he visited South America and in the same year represented the queen at the funerals of respected Commonwealth statesmen Sir Robert Menzies (1894–1978) and Jomo Kenyatta (c. 1893–1978). The prince went to Yugoslavia in 1979, to the Far East in the same year, to India in 1980, and to Australia in the spring of 1981. In February 1981 Charles's engagement to the Lady Diana Frances Spencer, daughter of Earl Spencer, was officially announced. The royal wedding, on July 29, 1981, was a magnificent and moving event that was viewed by millions worldwide on television. Marriage and the birth of his two sons, Prince William in June 1982 and Prince Henry in September 1984, did not affect the prince's busy schedule. Princess Diana accompanied him on many trips, and because of her youth, beauty, and style she developed a loyal following of her own that served to support but later overshadow her husband's position. While there had always been rumors that Charles and Diana were having problems with their marriage, the royal couple continued to make public appearances and raise their two sons. The twelve-year age difference between Charles and Diana, the intellectual gap between the two, and the claim that Charles had been pressured into marriage by his father were often discussed as possible causes of problems in the marriage. Reports began to emerge in the mid-1980s that Charles was having an affair with Camilla Parker Bowles, an old girlfriend he had once proposed to, but there was no proof until a series of tapes surfaced in the early 1990s. The revealing of taped phone conversations between Charles and Camilla proved that they were having an affair and eventually led to Charles and Diana's separation in December 1992. Because Diana retained custody of their two sons, it was originally speculated that she would still be able to be crowned queen one day. However, when the royal divorce was announced in 1995 these plans were dropped, though she was able to retain the title of Princess of Wales. In addition to keeping her title, Diana was awarded a settlement of $23 million plus $600 thousand a year to maintain her private office, from which she continued her charity work. For Charles the major problem was how to get the British people to accept Camilla after his popular ex-wife. One positive sign was in July 1997 when the British newspaper The Daily Telegraph gave their relationship its blessing: "She is good for his peace of mind, and is, therefore, performing a public service. It would make the best of a bad job if the public were to come gradually to accept this." The message seemed to imply that Charles was preparing the British people to accept Camilla as their possible future queen. For her part, Camilla emerged slowly as a society fundraiser, an important role for a possible member of the royal family. Prince Charles faced his biggest challenge after the August 31, 1997, death of his ex-wife, Princess Diana, in an auto accident. He became a single parent to princes William and Harry. British newspapers warned him that he "must cast off his stiff upper lip and reach out to his sons and the people of Britain, or he could lose both." Charles was prepared for the task, engaging in public displays of affection with his sons and introducing Camilla to them. He realized that his support was vital to their recovery from the loss of their mother. Prince Charles continues to take seriously the motto of the Prince of Wales, "Ich Dien," which means "I serve," and he does so by trying "to show concern for people, to display interest in them as individuals, and to encourage them in a whole host of ways." He works to promote organic farming methods (farming without the use of chemical fertilizers and pesticides [bug sprays]). During a trip to Argentina in 1999, he visited a memorial honoring Argentine soldiers who were killed in the war with Britain over the Falkland Islands in 1982. Charles also took an interest in Britain's housing problem, criticized modern architecture and helped plan new and better housing developments. It seems that he has changed the public's perception of him as stuffy and out of touch. As Maclean's Joe Chidley wrote while talking about a visit by the prince to Canada in 2001, "The response to Charles's visit seemed in keeping with the man himself—introspective [thoughtful], and preferring substance over ceremony." Barry, Stephen P. Royal Secrets : The View from Downstairs. New York: Villard Books, 1985. Dimbleby, Jonathan. The Prince of Wales: A Biography. New York: W. Morrow, 1994. Martin, Ralph G. Charles & Diana. New York: Putnam, 1985.